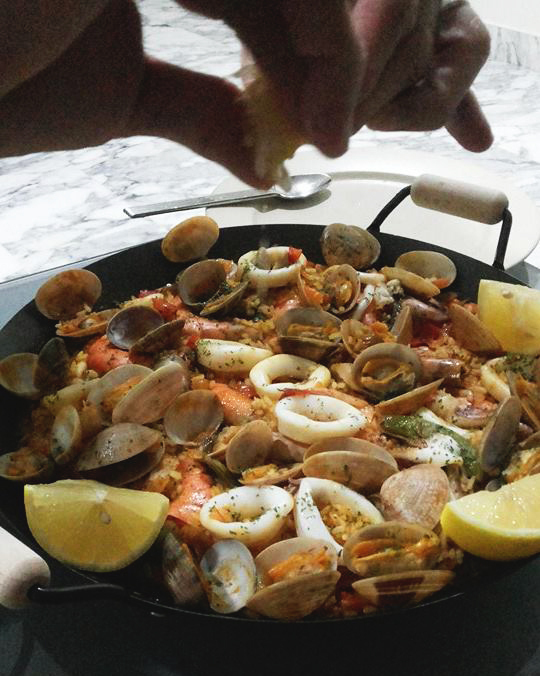 Paella originated in Valencia, Spain as a one-pan peasant dish made with a little bit of everything that is available to them.The key ingredients in this dish is fresh seafood, saffron and earthy paprika. I have tasted paella quite a while back in London but the unique taste of this dish has always been stuck in my memory. 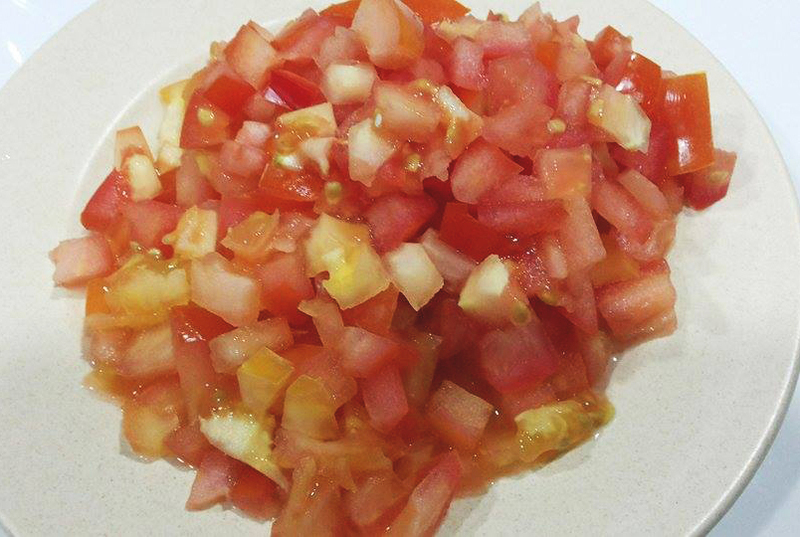 When a friend of mine gave me some saffron, I could not wait to cook this dish!! I also managed to get a paella pan so that it looks really authentic as if you are eating in a restaurant. (If you do not have one, do not panic. A heavy based pan will still do the trick!) Do not replace saffron with turmeric for this dish as saffron has a deep auburn colour and sweet flavour. 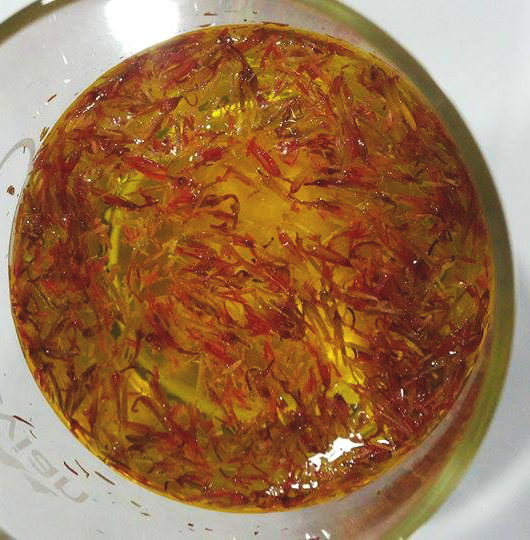 Though it is an expensive spice, a little saffron goes a long way. 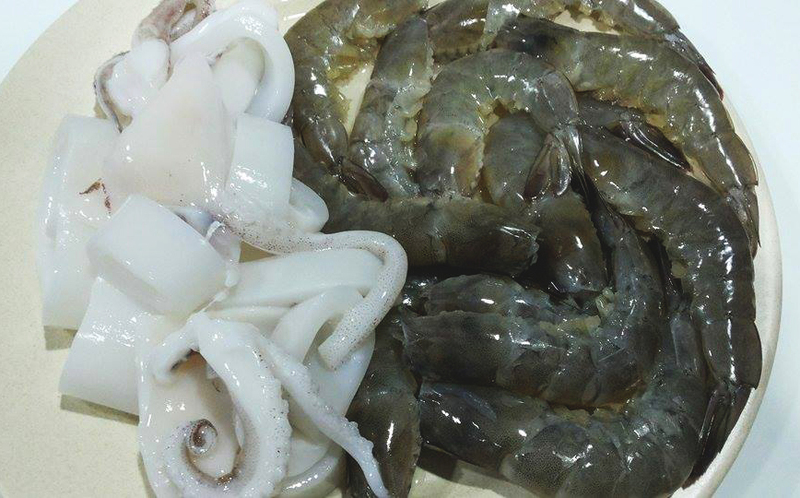 Boil a pan of water and then scald the squid and lift up quickly. 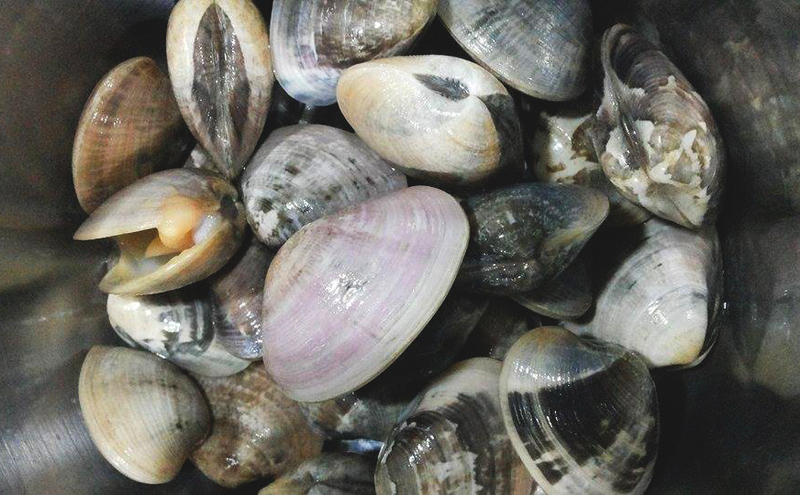 Then scald the clams and lift up quickly (The purpose is to remove some impurities from these seafood). Set aside. 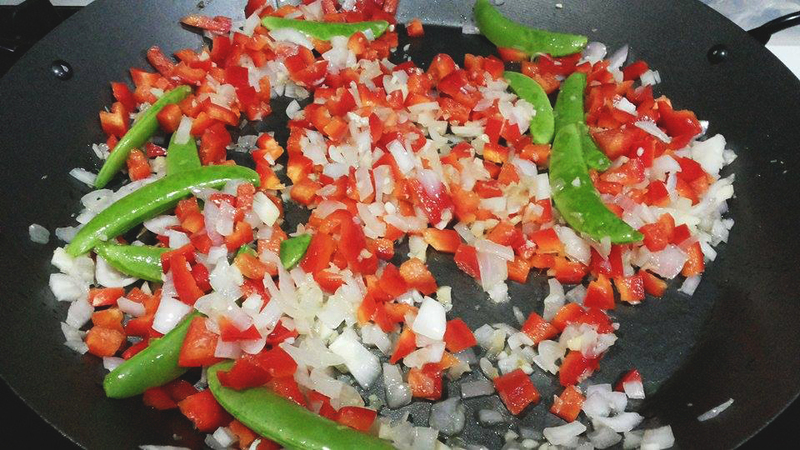 Add the garlic, onion and pepper and cook, stirring for 5 minutes or until onion softens. Add the rice to the pan, and stir to thoroughly coat the rice grains with the oil and juices from the pan. Slowly add in the wine with the infused saffron. Slowly add in 3/4 of the chicken stock until the contents are covered. 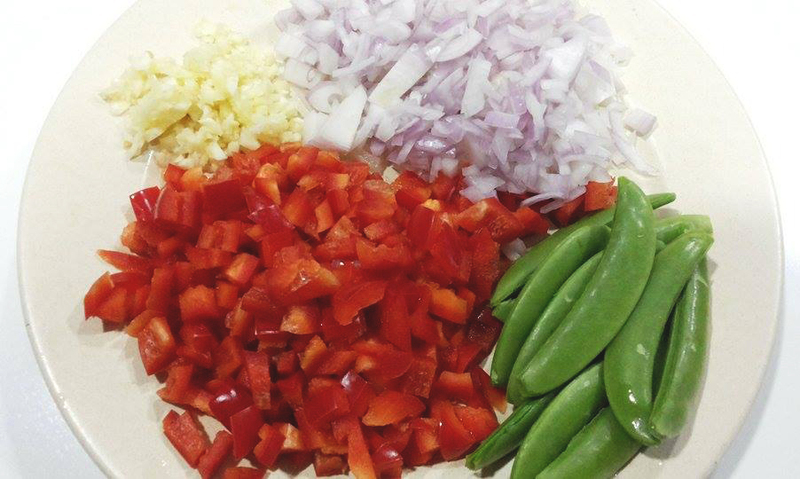 Spread rice and other ingredients evenly over bottom of pan using a wooden spoon or paddle. Bring to a boil then turn down the heat to simmer to cook the rice. Do this for about 20 minutes or until rice is almost tender. Monitor the progress and add more broth if needed. 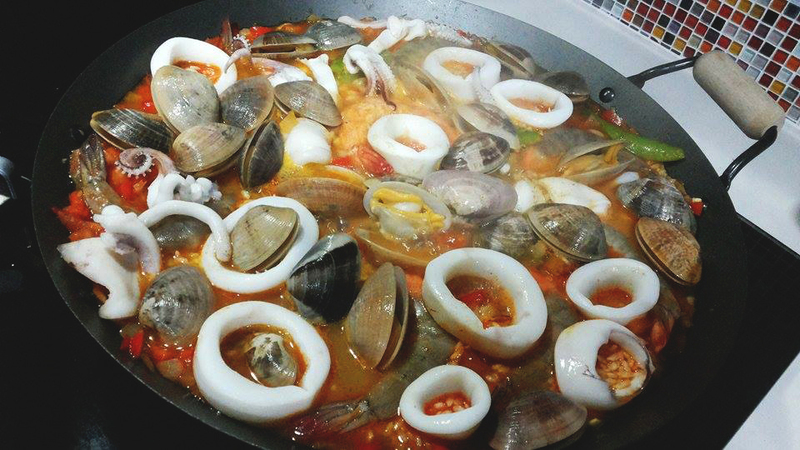 Place clams, squid and prawns on top and spread evenly around the pan. Push them into the rice and pour the rest of the chicken stock into the pan. Place the mussels around the side of the pan and scatter the peas evenly around if you are using them. 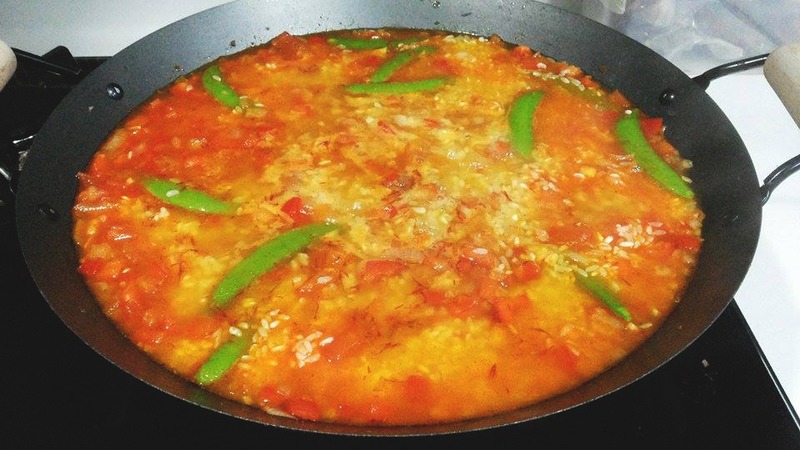 Traditionally, the paella is cooked uncovered (until the final resting period of the heat). However, some would suggest placing a lid on the pan and cook for 5 to 10 minutes more. Once the prawns turn red in colour and the clams and mussels are opened, they are cooked. Remove the clams that are not opened. When rice is cooked, remove from heat. 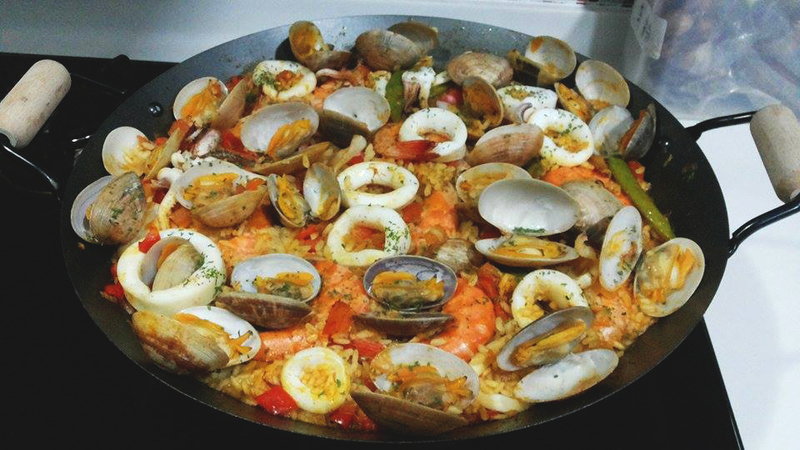 Cover the entire pan with aluminium foil, allowing the paella to “rest” for 5 minutes before serving. Remove foil, sprinkle the chopped parsley and squeeze 2 slices of the lemon wedges on the paella and serve. If you can find the paella rice also known as arroz bomba, it will be perfect. Do not stir, or disturb the rice while it is cooking. Allowing the rice to “rest” or reposar allows rice to fully absorb the broth, without letting any liquid evaporate. Any rice would work ? Yummy.. gonna to try. Btw u are using a chinese wok?